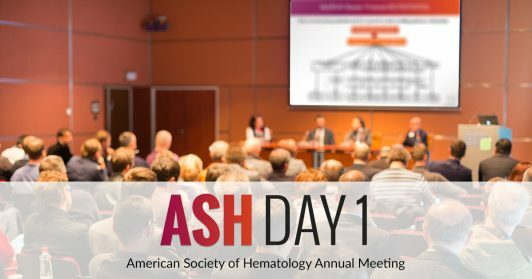 We close out the first day of ASH with the last myeloma session that focused on what’s new in the measurement of minimal residual disease (MRD). Additional presentations discussed the use of treatment combinations and stem cell transplantation at relapse. Currently, measurement of MRD depends on detecting myeloma cells in samples from the blood or bone marrow using techniques like next-generation sequencing (NGS) and multiparameter flow cytometry (MFC). However, there is little standardization of these tests, so resesarchers from Japan set out to compare MRD detection between these two techniques (ABSTRACT 258 https://ash.confex.com/ash/2018/webprogram/Paper111250.html). Thirty-nine patients received induction treatment and high-dose chemotherapy and stem cell transplantation. The cells collected for stem cell transplantation (both fresh and frozen) were used as samples for testing by both techniques. The clinicians found that although MFC was a fast and accurate methodology, it was not as sensitive in detecting minimal residual disease as NGS (could detect 1 myeloma cell in 10 million bone marrow cells). In addition to NGS and MFC techniques described in the previous abstract, imaging techniques like positron emission tomography and computed tomography (PET/CT) are also required to detect residual disease outside of the blood or bone marrow. Dr. Elena Zamagni of Bologna, Italy presented her work on standardizing the use of this PET/CT (specifically a technique called F-18FDG-PET/CT) to define criteria for MRD negativity after therapy (ABSTRACT 257 https://ash.confex.com/ash/2018/webprogram/Paper111321.html). Dr. Zamagni performed PET/CT scans on 236 newly diagnosed, transplant-eligible myeloma patients at baseline and again prior to the start of maintenance therapy. The images were reviewed by an independent panel of nuclear medicine physicians who assessed the images for the presence of myeloma in bone, bone marrow, or in tissue (called extramedullary disease) using a 5-point scale called the Deauville score. They found that PET/CT imaging was a reliable predictor of outcomes regardless of treatment. Achieving a Deauville score of ≤3 in the bone and bone marrow were predictors of longer time to disease progression and longer survival overall—and thus a potential definition of PET/CT negativity. Another notable abstract highlighted a study of patients who had relapsed from previous treatment. Researchers in Germany compared the use of stem cell transplant followed by maintenance therapy to continuous therapy only (ABSTRACT 253 https://ash.confex.com/ash/2018/webprogram/Paper111203.html). Their results revealed no significant differences in the time to disease progression between the groups; however, about one-third of patients who were unable to undergo stem cell transplantation. When the investigators looked at the patients that did go on to receive a transplant, they observed a significant survival benefit. However, they conclude that the role of transplant in the relapsed setting is still unclear especially now when patients can be offered a variety of triplet regimens at relapse. In a sub-group analysis of the same German trial, (ABSTRACT 254 https://ash.confex.com/ash/2018/webprogram/Paper119762.html) investigators showed that patients the patients who benefited the most from a transplant at relapse were those who had received a stem cell transplant as frontline (initial) therapy and those with low-risk disease (based on lactate dehydrogenase levels, cytogenetics, and International Staging System stage).